During this April 2016, an anniversary escaped the notice of most – 55 years have run their course since the Bay of Pigs invasion in 1961. All events gradually sink under the accumulating dust of antique time (1), and are eventually lost in the swallowing gulf of blind forgetfulness and dark oblivion (2). Still, the Bay of Pigs is worthy of historical memory and retention. Following the lead of a notorious “snapper up of unconsidered trifles” (3) let’s start with one of them. What’s in a name? 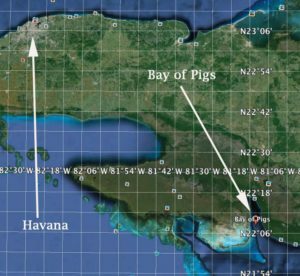 Pigs are quite adaptable creatures, but there is no evidence, historical or otherwise, of their native presence in or around the Cuban bay that bears their name. The riddle is simple. In Cuban Spanish, ‘cochino’ refers, in the instance, to a quite handsome tropical fish living in the reef close to the bay in question. In the narrative currents of this world, the US attempted to invade Cuba to bring back to the island the freedom and democracy previously enjoyed under the ruler Batista, when Havana was Miami’s peripheral brothel and the offshore Mafia’s headquarters. Even Hollywood has accepted this notion (Godfather III), but Cuba has a special place in American history, independently of the Cuban revolution, the Bay of Pigs invasion, the embargo etc. The historical seeds and roots of Cuban-American relations lie in the middle of the XIX century, in the events following the 1848 US invasion of Mexico. Mexico had been an independent nation since 1810, but in 1848 Congress decided that there wasn’t enough freedom and democracy in that country. The American army won decisive victories, occupying eventually Mexico City. After bitter debates in Congress, California was declared a slave-free state, while New Mexico was eventually declared a slave-state in 1860, just before the start of the Civil War, a bit too late to take advantage of the opportunity. You may think that having acquired the whole of the West, there would be a pause among the expansionists. No, a new accession to fortune glittered in their eyes. The next target was Cuba, where slavery had been abolished, at least nominally, thanks to the Convention of London (1840). In the instance, the US wanted to buy Cuba from Spain but Spain refused. First there was an attempt at an invasion by Narciso Lopez in 1851 (a Bay of Pigs invasion before its times). The Spanish forces captured Lopez and brutally executed him along with fifty American mercenary soldiers hired for the invasion. Ironically, it was Narciso Lopez who designed the Cuban flag. As it happened with the Mexican War, the mainstream media, in the instance the New Orleans Daily, printed that “American blood has been shed, Cuba must be seized”. Anger was fueled in the same way as the Iraq war was fueled. The bewildered reader will ask himself how can self-preservation be a reason for invading and annexing another country. 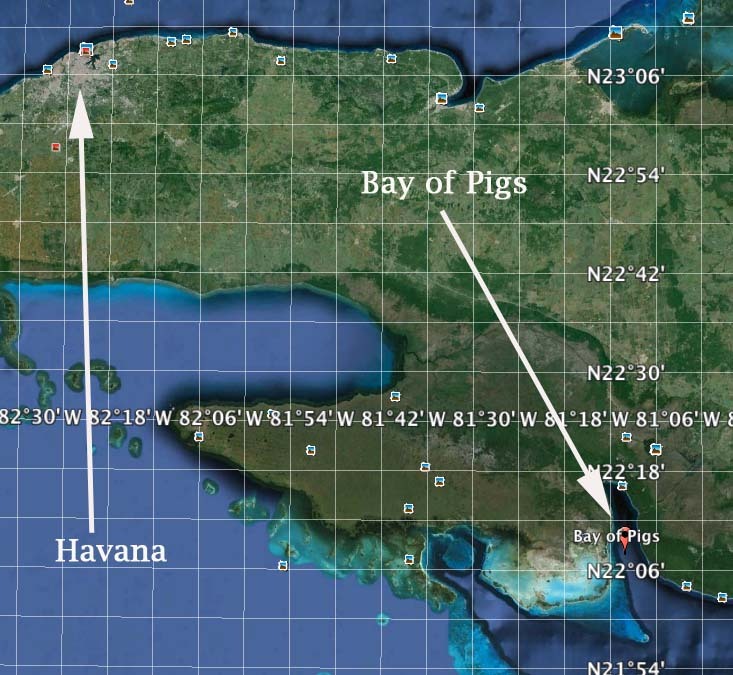 Here is where the parallel with the Bay of Pigs invasion stands out in its significance. There had been slave rebellions in the Caribbean, notably the Haiti rebellion – in the US South, the most famous had been the Nat Turner’s rebellion. Without invading Cuba, there was danger that the freedom movement would spread to the continental US. Self-preservation was then a euphemism for protecting slavery from the alleged destabilization that the slave emancipation in Cuba would create, by reflection, in America. Move time forward by 100 years. The attempted invasion of Cuba at the Bay of Pigs, would protect America from the destabilizing effect of a disapproved ideology, as reflected in the Cuban revolution. To maintain (or impose) an ideology, unappealing or unpleasant truths fade in total evanescence. For in the end, ideology is the magic wand that shapes reality. Ideology enables the retention of only those facts favorable to the supported thesis. It denies the value of any objection or confutation, however factual and logical. And, perhaps most importantly, it abolishes any notion of good or evil for the ideological players. With Cuba, the US had to wait another 30 years before annexing it. By then, the slavery angle of justification was dead, but the ideology of exceptionalism has an ample treasure chest from where to extract suitable justifications for its acts. And, were it not for the ensuing mass-murders, genocides and crimes against humanity, the official justifications would be a perpetual fund of merriment. In 1898 the US blew-up the cruiser Maine anchored in Havana. By accusing their purported enemy, the event enabled the US to declare war on the astonished Spain and to annex Cuba, Guam, Puertorico and the Philippines. Clearly, Castro’s defiant independence was a thorn in the ideology that inspired, then and now, the exceptional Nation. Today, hybrid warfare has become more sophisticated (and deadly). But in 1961, the CIA was still using old methods. The armament for the mercenaries came from the US, via Guatemala and then Nicaragua. The staging operation was based in Puerto Cabezas, Nicaragua. There is an interesting book written by a mercenary pilot (Albert Persons), on the failed invasion. It is interesting because it is written on the premise that the invasion was a good thing. Therefore, the account cannot be tainted with “Castrist” leanings. Particularly noteworthy, I think, is the general contempt shown towards the mercenary Cubans by the American mercenaries. As well as the anger at Kennedy, accused of cowardice for not unleashing the whole US military to invade Cuba – instead of resorting to camouflaged planes and other (frankly) ridiculous, similar expedients, which Kennedy was compelled to acknowledge one week after the event. Common, though unofficial, historical views link the Bay of Pigs failure to Kennedy’s assassination, along with the subsequent events leading to the missile crisis, involving Russia. But the Bay of Pigs also signals the moment when US finance-capital began counting more on the military to impose its will, rather than relying on the appeal of consumerism radiated from the West to the Communist world. And though “New customs,/ Though they be ever so ridiculous,/ Nay, let them be unmanly, yet they are followed” (8), the consumerism angle was losing some traction, in Europe and elsewhere. The time was ripe for harsher methods. In all this, one thing, for sure, has not changed, ideology. Actually, from a certain point of view, the ideology inspiring the Bay of Pigs invasion is even stronger, thanks to the influence of neo-liberal economics, born-again Christianity and the curious convergence of an even newer kind of Christianity with Zionism (see this). Now America no longer needs any excuses, as this video snippet by a Nobel Peace Prize winner makes abundantly clear (see this). Readers will have noticed the recent media emphasis on the new distensionist US policy towards Cuba, including Obama’s visit to Havana, earlier this year. Those who looked at Cuba as a living counter-balance to neo-liberal ideology, are concerned that the country may quickly return to the glories of the Batista regime. It is assumed that each of us ran the risk of a heart attack on hearing these words from the President of the united States. After a ruthless blockade lasting almost 60 years? And what about those who died in the attacks by mercenary ships to Cuban ports, an airliner full of passengers detonated in mid-flight, mercenary invasions, multiple acts of violence and force? Let no one cultivate the illusion that the people of this noble and self-sacrificing country will relinquish their glory, their rights, and the spiritual wealth gained with the development of education, science and culture. This entry was posted in After Dinner Quotes, Best Shakespeare Quotes, Business Presentations, Philosophical, Psychological & Historical Considerations, Presentation Ideas, Shakespeare and Politics, Shakespeare in Politics, Shakespeare Invocations, Shakespeare on Mass Psychology and Group Behavior and tagged After Dinner Quotes, american foreigh policy, Bay of Pigs, best fashion quotes, best shakespeare quotes, famous Shakespeare quotes, fashion, forgetfulness, ideology, indexes, interpretations, masses defined, new customs, seeds of time, time predictions, trifles. Bookmark the permalink.